Your family can have an adventure-filled Spring Break that doesn’t break the bank in Bowling Green. We’re a fun, affordable city with plenty to keep your kids occupied, whether you want to visit for a couple of days or spend your entire break here. Here’s are the Top 10 ways you can "brake" for spring in Bowling Green! 1. 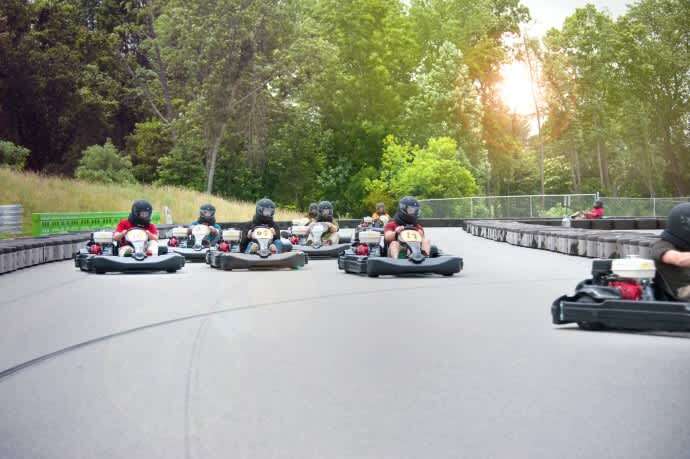 Race your family at the NCM Motorsports Park Kartplex. Check out the fastest go-karts in the area and see who in your family has the potential to be a pro racer. There are junior race karts for kids who are at least 48-inches tall, and if you have a younger rider who is at least 42 inches tall, let them be the passenger with a parent in a double kart. 2. Head from the Motorsports Park to the National Corvette Museum where you can discover the history of America’s Sports Car. Let the kids explore in the Kidzone, where they can design, build, and test their own cars, among other activities. Kids love learning about space! Take them to see the museum’s latest exhibit From Gas Station to Space Station: How NASA Conquered Low-Earth Orbit. You’ll even get to see a couple of Corvettes that were owned by astronauts! 3. Experience BGKY from the sky and underground at Lost River Cave. Take the only underground boat ride in the state as you learn about the geology and history of the region. Follow that with a trip across Lost River Cave’s ziplines. The Flying Squirrel Zipline is for participants ages 8 and older, and the Lightning Bug Zipline is for kids ages 3-10. Call in advance to make sure the ziplines are open the day you&apos;ll be in town. 4. Take a nostalgic trip to the Historic RailPark & Train Museum in the L&N Depot, an art deco train station built in 1925. You can tour both vintage railcars and the museum, as well as schedule an escape game on their caboose. 5. If one escape game just isn’t enough for you, visit Conundrum Workshop, which offers escape games, art classes, and more. If you’re looking for a challenge, Vertical eXcape is an indoor climbing gym that offers an afternoon of exercise and fun for ages 5 and up. 6. You’ll need at least one sweet treat on Spring Break, so why not visit Chaney’s Dairy Barn, where you can try the ice cream that USA Today named the best in the state. Let the kids play on Chaney’s phenomenal playground (at no extra charge) or pay a nominal fee to do a self-guided farm tour or play on the jumping pillow. 7. Depending on when your Spring Break is, you might be able to catch the Bowling Green Hot Rods on one of their April home series. The Hot Rods are the reigning Midwest League Champs, and they are a Single-A affiliate of the Tampa Bay Rays. Let the kids watch America’s past-time — or have a ball at the BG Ballpark’s playground and Merry-Go-Round. 8. What kids don’t love seeing planes up close? Check out Aviation Heritage Park, where you can see military aircraft with ties to Warren County-area residents. After you learn about these planes and the heroes who flew them, head over to adjacent Basil Griffin Park for a beautiful evening outdoors and even feed the park’s resident ducks. Your kids may also enjoy a trip to the Bowling Green-Warren County Regional Airport, where they can see small aircraft coming and going. 9. The Kentucky Museum on campus at Western Kentucky University offers free admission, and your family can explore both its permanent and temporary exhibits as well as learn more about our favorite foodie, Bowling Green’s Duncan Hines. Another attraction with WKU ties, the Baker Arboretum, is also free to tour and the perfect spot to see the season in bloom! 10. Gear up for your spring and summer adventures at Nat’s Outdoors, a local sports outfitter that has been in business for decades. Whether you play disc golf, run, hike, or bike, you’ll probably find what you need at Nat’s! We also have the places where you can get some great eats and a nice place to rest your head! Request a Visitors Guide for more ideas to help you plan your Spring Break in BGKY. Beth Noffsinger is Public Relations Manager for the Bowling Green Area Convention & Visitors Bureau. When she is not working to promote Bowling Green to national and international media, she enjoys exploring Bowling Green, and the rest of the state, with her husband and daughter.